Second part of the cronicles and tals, that takes us far from ordinary world, Schwarzer Engel - Imperium II: Titania captivates the mind for its fabulous variability. Cryptic mysterious sounds of the Es Offnen Sich Die Tore... riveting attention, involving to continue listenig of the tale by thoughtful calm narrator, crows caw and intriguing keyboards. Drums thrashes obstacles with drumming, crushing barriers with bass notes, keyboards passages exalted over that battle, like disembodied spirits. Next Titania reveals its secrets, expounding the mysteries in the verses of this story, so in chorus flurry of instrumental rabies supports and praises up the repetition of Titania word a lot of times! Raising around itself eternal ruins, mysterious curtains fills the broken windows, blind eyes can't see what happens now, but behold the distant future beings. So Vater Der Vampire is the main part of that family! Curdling sounds passionate the Wintertod, circling by blizzard, ringing snowflakes on travelers, that starks because of frost. But the snow is flying and spinning without the least tired, jingling all the frozen surfaces, leading the story of all the surrounding sacrament of cold and frost. In Der Halle Des Bergkonigs cover on composition from classical suite "Peer Gynt" created by Edvard Grieg. This version includes a harsh vocals of angry troll king, complete with keyboards passages. He worries about the choice of his daughter, broadcasting which reaches pacified growling. But criers spread the news to all the localities of the kingdom of trolls. Troll's rampages soothing lyrical melodic ballad Weltweit. Quiet sound takes away from surrounding problems, pulling sad mind in search of truth and meaning. Starting as a brooding quiet ballad with a touch of dance Himmelwarts changes from time to time - first becomes a militant midtempo thriller, then again returns to the calm balanced emotional ballad. After the ballads, sad and melancholic Versuchung appears to us as decisive and destructive squad, that nobody and nothing can deter or prevent its progress. Only they will arrange respite around the campfire, to gain strength for sharp and devastating conclusion. Dance motifs permeate the whole EinMensch, short vocal phrases only make a breaks in quick rhythm, which subordinates the vocals to its will. Instrumental despair burst and sublime moans returns vocal to the ballad mood, in which it completes the composition. Saying goodbye is not so easy - pulls to remember all past acts, joint joys, shared sorrows. Abschied obtained as melancholic ballad vocals is only serving to shimmering sounds of keyboard passages, followed by the first role out a guitar solo. But the emotional vocal phrases and keyboards trills beneath the sky complete the composition for its dreamy gusts - oh, it's so hard to say "Goodbye!" It was hard to say goodbye, but these words were spoken - with difficulty, bringing pain, sadness, frustration ... therefore outro ...Es Schliessen Sich Die Tore is purely instrumental, viscous, dense and powerful. There are things with which no use to bid farewell - they always will be near, even imperceptible. 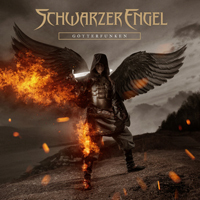 You could never heard about them - but soon you go away into oblivion, they - will remain forever, Schwarzer Engel - Gotterfunken (EP) understand that and try to become a part of the unforgettable classics. Beethoven, Ludwig cover Gotterfunken starts the march of the eternal images, that lasts for many generations and many centuries. But EinMensch is a part of eternity, a little bit of all over the world, carrying their petty concerns through its brief existence. The piano repeats the beginning of this artwork, Gotterfunken (piano version feat. El Friede) shows us the unforgettable classics from a different perspective, complementing the immortal notes with quiet creaking screech of gramophone records. Versuchung (piano version feat. El Friede) takes us from the timelessness of eternity in the world of simple desires, which entice their intelligibility and tangible. But not all that easy to see - just so simple to take. Not everything that you can imagine - simple to have and enjoy that. This contrast is embodied human perishability. So the story ends.